I’m not gonna lie, I was pretty stressed about going back to Cali, Colombia. Sure, I ended up finishing sixth in the sprint event after a physically taxing Keirin. Even though I was a bit rusty, I think it’s a good step looking ahead to the 2020 Summer Olympics. But Cali is more than just another competition for me. It’s the track where I almost died. My world came crashing down on me during that training session in October 2015. Just before I hit the rail, I turned my head to avoid colliding with it head-first at 80 km/h by a couple of millimetres. When I woke up, I knew if I had hit it face first I probably wouldn’t have woke up. Before the crash, I was exactly where I wanted to be with my career. 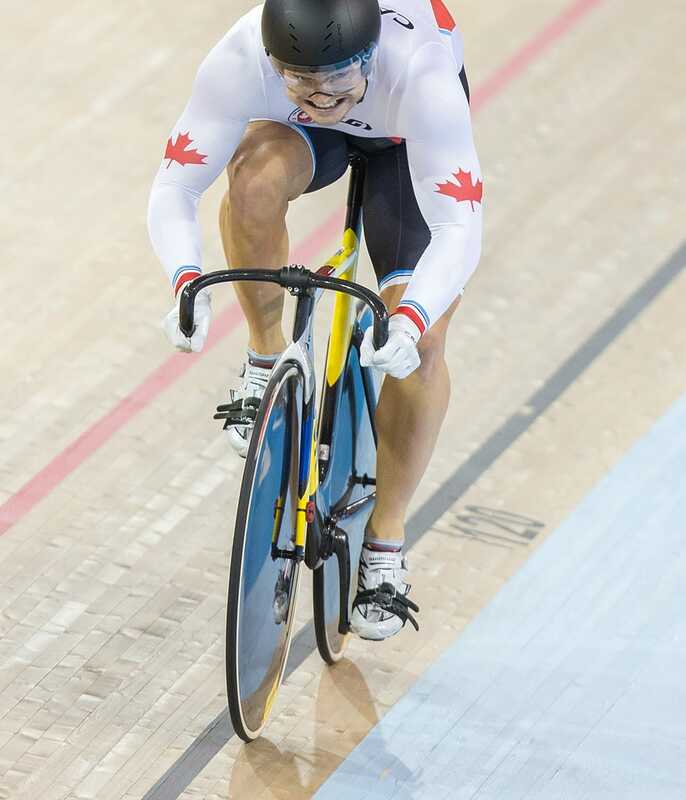 After leaving my little island of Les Îles-de-la-Madeleine at 16, I built a career out of almost nothing and went on to win two gold medals and a bronze at the Pan Am Games in Toronto. Cali was the next race after that. After the crash, I was just happy to be alive, just happy to be able to look forward and get back on my bike, which is the thing I love to do the most in the world. I bet most people wouldn’t believe I got back on a bike just two weeks later. I’m still not sure how I did it either. I remember there was a doctor who told me I was like Wolverine because of how fast I healed after fracturing the L2 and L3 vertebrae in my lower back pretty bad, breaking my nose, lacerating my skull, ripping off part of my lip, dislocating my shoulder all while being covered in contusions. I got X-rayed maybe two-and-a-half weeks later and everything was melded back together. The doctors said, “hey, well...we don’t really know what’s happening.” I questioned it myself actually. Maybe it’s that some people recover more quickly than others, but I think that it has something to do with how much I put my body through, especially my back. My training regimen has me in the gym three hours a day, five days a week, and that puts so much strain on my back that I have microfractures in my bones on a daily basis. So maybe in this case, my body was ready to heal itself because I go through those little fractures all the time. But hey, I don’t know. Maybe I just got lucky. I felt alright the first time I got on a stationary bike. I felt ready to give it my all but I had to progress gradually because everyone around me was so surprised that I was on the bike. A lot of people actually didn’t agree with me going on the bike, they thought it was ridiculous. But there were also people who trusted my judgement. I’m not stupid, I wouldn’t have done it if I was hurting and I wouldn’t have gone full out if I still had a concussion. But I didn’t have any headaches or pain anywhere, so I kept going harder and harder, and within a week, we said “let’s try a real push” and everything was fine. From there it was on to Hong Kong for the last Olympic qualifier; one race to do well enough to qualify for Rio, and I did, winning silver. The crash rarely ever enters my mind when I’m racing. The one time it did was at the Games in Rio because the track was similar to Cali. That was a bit of a surprise; no one told me about it before I came. It definitely reduced the stress because I was able to go full tilt on the track. Like Cali, it was super technical, super tight corners so I just needed to be careful. What I was most worried about returning to Cali was going fast on the track. It was my first big race since the Olympics, so it was stressful to go all out. When you’re all out you get up to 80 km/h on two little tires. Usually I do this on a daily basis so it’s never scary, it’s just part of my life and I don’t necessarily realize how fast I’m going because I do it so often. The last time in Cali I was going faster than I’ve ever gone in my career and I wasn’t vigilant. I should’ve been more careful on the track instead of going all out right away with no practice on that kind of track and that’s when things went wrong. I need to approach it more carefully this time, progress gradually and then go all out. I think about it still to this day, but it’s part of the learning process. If that’s what it takes for me to be more careful going forward, so be it. When I make a big mistake, I make sure to never do it again, and that’s how I treat the crash. I don’t intend for the crash to define my career. I still plan on becoming a world champion, and that one event is just a part of that journey. I know what I can do on the track. When people see me perform, they know what I’ve been through to get there, and that’s something special. You have to go through really rough times to get to the top, and once I get to the top people are going to respect that accomplishment even more.